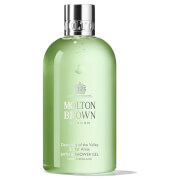 Awaken your senses with the Bursting Caju & Lime Bath and Shower Gel from Molton Brown. Inspired by Brazil's national Caipirinha cocktail, the energising body wash blends lively notes of Lime, Grapefruit and zesty Lemon with invigorating Spearmint and contrasting woody aromas of Fig Tree, Galbanum and Oakmoss. Infused with Caju Fruit Extract (rich in Vitamin C), the bath and shower gel gently cleanses from top to toe, whilst its colorful beads burst onto skin for a cleansing experience that is reminiscent of Brazilian carnival confetti. The body is refreshed, hydrated and revitalised with a long-lasting fragrance.